We live in a wonderfully creative community. Here are some great ideas to relax, unwind and use your own creativity and learn new skills. "I highly recommend�Glazed All Over�to all Local Mums. I enjoyed a wonderful evening with friends at one of their Ladies Nights recently. What a wonderfully relaxing way of spending a Friday evening, completely focusing on something new and emptying the brain of everything else. It was like art therapy for a tired mind!" Our hugely popular Ladies Nights give mums a chance to chill out, unwind, catch up with friends and be creative. It's a great opportunity to relax and do something for yourself. You bring the wine and nibbles and we bring the fun! Glazed All Over�also run evening Glass Workshops for adults offering you the chance to try something a bit different without needing to commit financially to a year-long course. 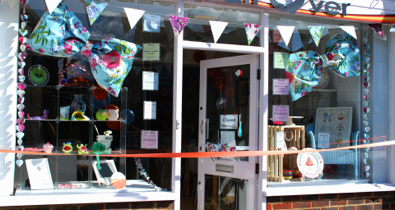 These workshops allow you to take some time out, relax and learn a new skill. 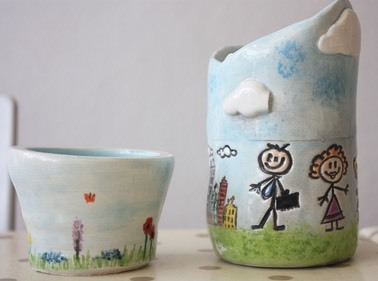 During the course children will learn to work with clay making lots of exciting projects. They will learn to make pinch pots, coil pots and slab pots as well as working with slabs to make hangers. During October they will make things for Halloween and in December they will make decorations ready for Christmas. There will be a maximum of 8 children per group to allow for individual help. Please note that children below 7 years old must be accompanied by an adult. Please phone us on 02086476463 or email�info@glazedallover.co.uk�for more information and to book a space. 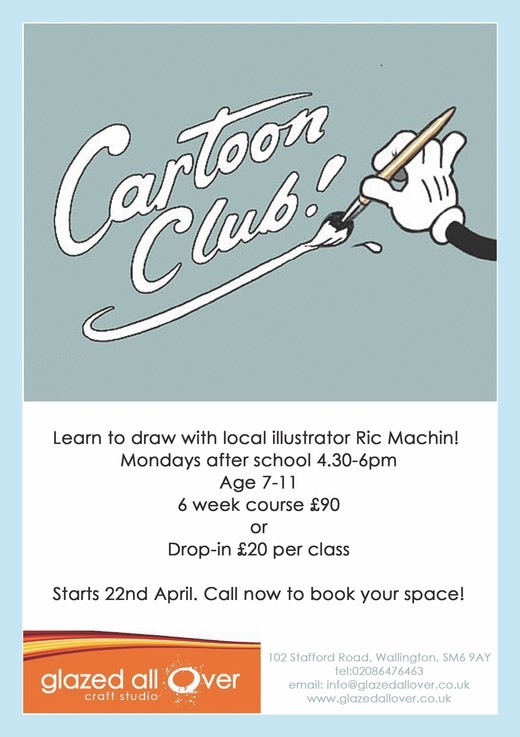 Learn to draw with illustrator Rick Machin! Call now to book your place!